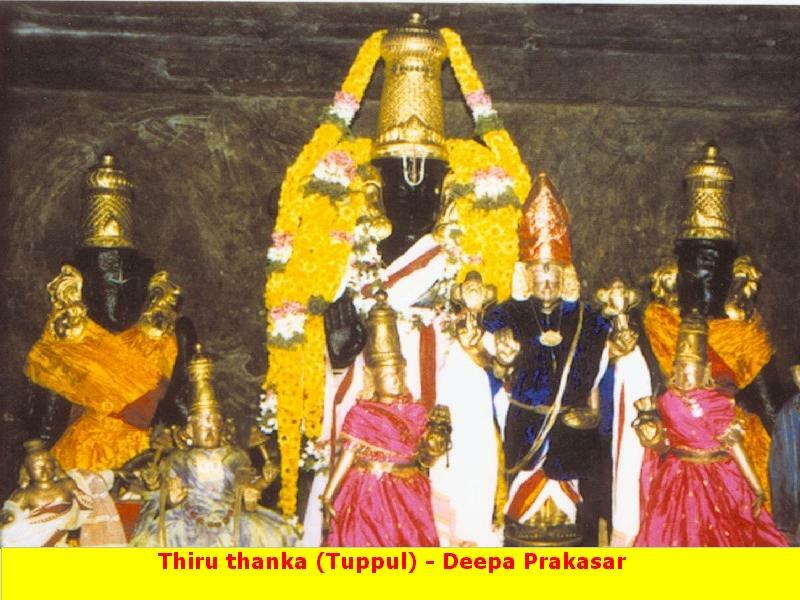 Thuppol/Thiruthanka is one of the 108 Divya Desams of Lord Vishnu situated in Kanchipuram, this temple is just ½ kms away from Ashtabuyakaram Temple of Lord Vishnu. Most significantly, this is the birth place of Sri Vedanta Desikar, the life of this great Vaishnavaite saint is stunningly depicted on the sannidhi praharam wall of this temple. The illustrious scholar and Philosopher Sri Vedanta Desikar had unparallel devotion to Lord Varadaraja Perumal which was evidently visible in one of his compositions Varadaraja Panchasat, he sung praising the glories of Lord in sacred fifty verses. During Brahmostavam of Lord Varadaraja, Lord pays visit to Thupool and resides here for three days. On Garuda Seva day, Lord Varadaraja presents his garlands to Desika Acharya and pays tribute to his fervent devotee. In this way Lord pays continuous visit and homage to his zealous devotee during the Brahmostavam. Lord Varadarja pays periodic visits to Thupool on the auspicious days of Chaitra Pournami and on the twelfth day after Vaikundha Ekadashi. On the day of Anushtanukulam Lord Varadaraja with Ubayanachiyars taken for a procession to Sevilimedu and pays visits to Sri Ramanuja Acharya’s shrine who was a passionate devotee of Lord Varadaraja, great preceptor and scholar of Vaishnavism. On the way back from Sevilimedu, Lord Varadaraja and Ubayanachiyars pays visit to Sri Vedanta Desika in Thupool. The frequent visit of Lord Varadaraja to his zealous devotee Sri Vedanta Desika creates a heavenly ambiance in this shrine. Vilakkoli Perumal temple in Kancheepuram is one among the 108 Divya Desas of Lord Vishnu. Perumal granted darshan to Mother Saraswathi in this temple. The place is also known by the name Thoopul as it was dense with Dharba grass then. This is the birth place of noted Vaishnava Acharya Sri Vedanta Maha Desika, hence the Acharya is also praised as Thoopul Vedanta Desikan. Saint Tirumangai Azhwar had sung his Mangalasasanam on the temple. Sri Maha Desikan is a gift to his mother who prayed to Lord seeking child boon. Responding to her prayer, Lord of Tirupati – Lord Venkatachalapathi asked the Bell in His hand to be born the son of the mother. Bell is not used during pujas in Tirupati temple after this event. Born in the year 1268, Sri Desika was centenarian plus till 1369. He was an outstanding scholar of highest degree in the scriptures. He rendered a large number of Sanskrit works in Tamil. He has also authored in Tamil the Adaikala Pathu (Asylum 10) on Lord Varadaraja Perumal. Lord Brahmma the Creator was sad that he had no temple in Earth and conducted a yajna dedicated to Lord Shiva. He failed to invite His own consort Mother Saraswathi. Angry Saraswathi cursed that there should be no light to conduct the yajna. Brahmma fell at the feet of Lord Vishnu for light. Perumal granted darshan to Brahmma in the form of jyoti-light and helped him. As Perumal gave light – Vilakku Oli in Tamil- He is called Vilakkoli Perumal and Deepa Prakasar in Sanskrit. Perumal also helped a compromise and re-union between Brahmma and Saraswathi. Festival: The event of Lord Varadaraja Perumal granting Darshan on His Garuda vahan to Saint Vedanta Maha Desikan in Vaikasi is grandly celebrated in May-June. The Aavani festival in August-September of Lord Vilakkoli Perumal visiting Desika’s shrine and the one in Margazhi (December-January) of Perumal honouring Desika are the festivals that demand many eyes for the devotees to enjoy the Lord’s grace. The Vimana above the Sanctum Sanctorum is called Srikara Vimana. There are shrines in the temple for Mother Sri Mahalakshmi, Sri Andal, Lord Hayagriva, Lord Deepa Prakasa, Azhwars, Garuda Bhagwan and Acharya Sri Vedanta Maha Desikaswami. Devotees pray for child boon and to achieve excellence in education. The temple is open from 07:30 a.m. to 10:00 a.m. and from 05:00 p.m. to 07:00 p.m.
Thoopul is located in the temple town of Kanchipuram, which is approximately 70 kilometres from the South Indian metropolis of Chennai. Kanchipuram is a bustling town with plenty of options for stay and food. Covering all 15 Divya Desams in Kanchipuram can take between 1-3 days. Mobile : 98944 43108 / 94475 73942.
your wishes will be granted by HIM.